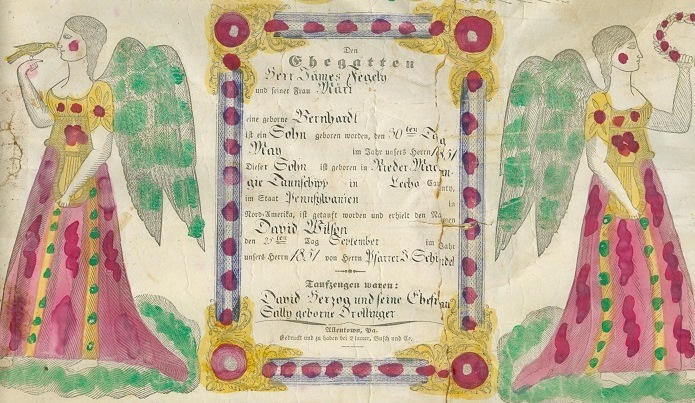 The year was spent going deeper into our collective Pennsylvania German origins, including the discovery of this 1851 taufschein -- birth certificate -- of cousin David Wilson Fegely..
Now in its 19th year online, the main focus for Minerd.com in 2018 was bringing to life more of the lost stories of forgotten Pennsylvania German families and their impact on Americana. The numbers bear out the incessant activity of adding new material, up in some areas, down in others but always in motion generating content. The 2018 focus primarily was in four ways – biography research for the Pennsylvania German family of Elizabeth (Meinert) Gaumer of Berks and Lehigh Counties, Pennsylvania and Muskingum County, Ohio, and creation of the online Gaumer Archives – research of newly discovered Civil War soldiers in the family, including National Archives soldier pension research in Washington, DC and a tour of the Gettysburg Battlefield – completion of publication the Nett-Helen Letters, a project which has taken seven years to complete – and a deeper dive into the German-ness of our forbears with an examination of the remarkable endurance of the culture and values over many generations. The Gaumer Archives is a big, hairy and audacious effort to catalogue "who's who" among the hundreds of branches of the family of Johann “Dietrich” and Elizabeth (Meinert) Gaumer and tell their unique stories. This early Pennsylvania German couple produced 11 children, 40+ grandchildren, 132+ great-grandchildren and an unknown number of great-greats. This year’s research largely focused on branches who stayed for generations in Berks and Lehigh Counties, PA and some who settled in Muskingum County, OH, spanning some 270 years of human activity, joy and grief. 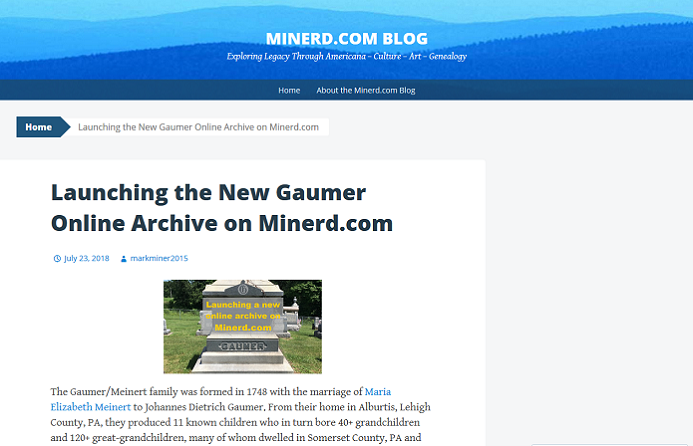 On July 23, 2018, the Gaumer Archives was officially announced on the Minerd.com Blog to help lead readers into their experiences. The Gaumers are fascinating. Unlike their Minerd-Miner cousins who migrated to southwestern Pennsylvania, they were slower to relinquish their German ways even while making many contributions to Americana. They spoke the language in dialect for many generations. Scores of their grave markers in rural cemeteries in the Allentown to Reading corridor are inscribed in the German gothic script, and a number of taufscheins and confirmat scheins (hand-lettered birth and confirmation certificates) came to light from the 1850s, '70s and '80s. In the 20th century, several of these cousins in Allentown became renowned, published experts on Pennsylvania-German history. Historic New Hope Lutheran Church and Cemetery in Adamsville, Ohio, bearing the dust of generations of Gaumer descendants, on land donated by Revolutionary War veteran Johann "Jacob" Gaumer. 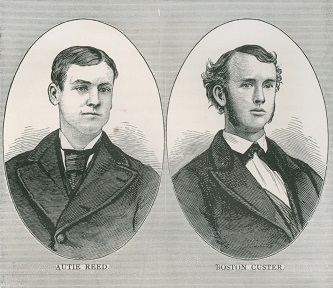 Among the myriad newly discovered Gaumer stories, one was a Penn State University athletic director who hired Joe Paterno as head football coach; a business owner who married a Ziegfeld showgirl only to die young, leaving her with millions; soldiers who served from the American Revolution to the present day; many killed in wartime and in industrial and railroad accidents; and a host of talented entrepreneurs, furniture makers, stonecutters, mechanics and craftsmen. The Berks and Lehigh County communities of Alburtis, Allentown, East Greenville, Emmaus, Mertztown, Macungie, Pennsburg, Pottstown and Old Zionsville were the epicenters of the families as they grew in number and influence over the generations. Lutheran and Reformed churches in these small towns often were the part of the core of their lives and today preserve the German records of their births and baptisms. During a May 2018 visit to New Hope Lutheran Church Cemetery in Adamsville, Muskingum County, Ohio, I enjoyed several hours photographing scores of grave markers of Gaumer cousins spanning many generations. The land for this old burying ground was donated in 1811 by Revolutionary War veteran Johann “Jacob” Gaumer and his wife Catharina (Sowash) Gaumer. Vital details of the minutiae of their lives were preserved in history books, newspapers and government records now seeing a second life thanks to Ancestry.com, Google Books and Newspapers.com. Most especially, the Allentown Morning Call and Zanesville Times-Recorder chronicled the history of generation after generation of these families, randomly scattered in print over decades. The website FindAGrave.com has been essential to this search. This compilation of Gaumer names and relationships has only been possible through earlier research, writing and gracious sharing by the following individuals: Eber and Marguerite (Lepley) Cockley – Gilbert R. Gaumer – Jeanne Gaumer – Lucie (Burditt) Gaumer – Paul K. Gaumer – William “Bill” Gaumer – Jeannie (Beghart) LaCues – Kenneth Moffitt – Eugene F. Podraza – Mary L. Shirer – Garold W. Sneegas – Keith Sturts – Paula (Gaumer) Tooke – Barbara (Moss) Wardsworth – and Myrtle (Knepper) Weniger. Above: the National Archives building in Washington, DC, which houses an extraordinary collection of Civil War pension records for hundreds of our cousin-soldiers. Below: 5 sons of Leonard and Catherine (Younkin) May of Bedford County, PA served in the Union Army.. While touring the Gettysburg National Battlefield in August, it dawned on me how many relatives from different families served in the 18th Pennsylvania Cavalry and whose names adorn the Pennsylvania Monument. They include the following: Company A, circled in order: John Finnegan - Henry Hinerman - Henry C. Ullom -- and in Company C, John McKean. Later that day, I visited the actual spot, at the very southern tip of the battlefield, where the 18th Cavalry was in action. The remarkable quiet of this site, surrounded in dense forest, contrasts to the chaos and horror these soldiers would have experienced. I rarely take selfies but could not resist snapping one at the 18th Pennsylvania monument to capture the moment. In July, I was honored to be asked to speak at the annual Junghen-Younkin Reunion in Somerset County, Pennsylvania. This included a morning tour of the Turkeyfoot Valley Baptist Church in Confluence, above, which contains several stained glass windows in memory of deceased cousins. From there we toured the Ursina Cemetery, below, where many cousins sleep for all time. As well, at the request of the planning committee, I again led the auction to raise funds for the Heinrich Junghen Scholarship. Check out the Younkin Reunion page on Facebook, where I frequently post research updates. Capping a long quest to find a collection of letters written among adult brothers and sisters in Kansas and Missouri spanning more than three decades from the 1880s to the 1910s, the letters finally were posted in full on Minerd.com. 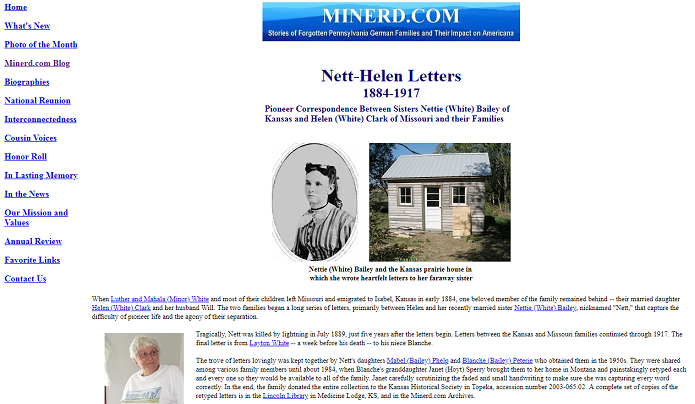 I call the set the "Nett-Helen Letters" as they primarily were exchanged between Nett (White) Bailey in Kansas and Helen (White) Clark in Missouri, until Nett tragically was killed by lightning in 1889. Here's the backstory. While in the Morrow County Library in Ohio in 1996 with cousin Eugene Podraza, we found a small privately printed book about the very family we were exploring, Daniel and Margaret (Fluckey) Miner Sr. It is entitled Ancestral and Chronological History and Lineage of the Family of Luther White and Mahala (Minor) White, Their Forbears and Descendants, 1665-1971. To our fascination, the volume contains an entry about old letters. It lit a fire in my mind. I vowed someday to find these. Some 15 years later, Eugene and I went to south-central Kansas to research the White branch in person. Part of the time was spent in Medicine Lodge, KS at the Lincoln Library. As the library closing time was approaching, we decided to leave a little early and visit the nearby Highland Cemetery to photograph one particular, obscure grave. As we arrived at the small burying ground, we saw the caretaker parked in a truck, as if awaiting someone's arrival. We stopped and asked if he could guide us to the grave in question. He replied that he was waiting for a woman to come who also was seeking that very same grave. This blew our minds. So he took us to the stone. We paid our respects and shot photos. Sure enough, another vehicle arrived and the silvery-haired Janet (Hoyt) Sperry stepped out. She approached us and we made introductions. It quickly became apparent that Janet was the one person in the entire world who knew the most about the letters and had actually retyped every one, with the originals deposited in the Kansas State Library and a full set in the very library we had just left. To my amazement, she also said she'd been on my website and knew all about the Minerd-Miner research. The very next day, we returned to the lLibrary and copied the file start to finish. Some time later, I called Janet and asked if I could republish them on Minerd.com. She readily and enthusiastically agreed. It took seven years to complete the work, with scanning assistance from my colleague Jean Wachter. What a delight it was to call Janet on the recent New Year's Day and tell her "It is done." Enjoy! 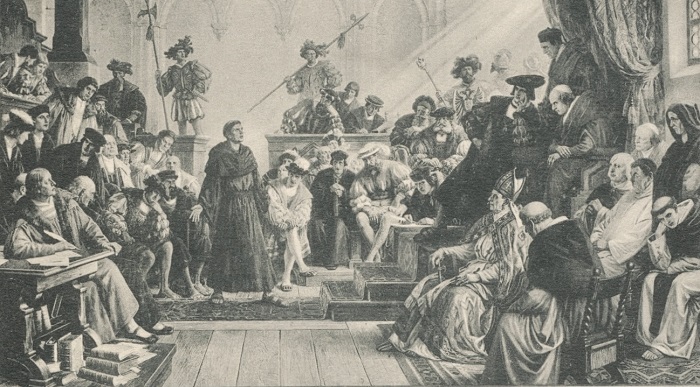 One of the most profound events impacting the German values our people brought to America was Martin Luther's appearance at the 1521 Diet of Worms, refusing before church fathers to recant his criticisms of the Pope and Roman Catholic practices, leading to excommunication and formation of Protestant Christianity. "The Germany Broughtwith" is the working title of a proprietary study I began in 2018 to capture a wide sweep of German culture which our immigrant ancestors brought to American shores. Some initial highlights I’ve uncovered so far are the proliferation of German Bibles as a mainstay of family life; Martin Luther’s break with the established church and standardization of the German language; the unshakeable role of authoritarian father figures; a land laid waste by the Thirty Years War and Peasants’ War, which scattered Germans far and wide; a spiritual “inner life;” unique cooking and food specialties; an exceptionally strong work ethic and well-organized farming; and endurance of the German tongue into the 20th century. Among the books I read during the year were Germany: Memories of a Nation by Neil MacGregor; Luther the Reformer by James M. Kittelson; Here I Stand by Roland H. Bainton; Civilisation by Kenneth Clark; Goethe: Life As a Work of Art by Rüdiger Safranski; The Peasant War in Germany by Friedrich Engels; The Thirty Years War by C.V. Wedgwood; Old Zionsville by Henry L. Snyder; Printing and the Mind of Man by the British Museum; Martin Luther: Treasures of the Reformation by the Minneapolis Museum of Art Staff and Morgan Library and Museum Staff. When this study is complete and ready to share, I'll announce it on my blog. 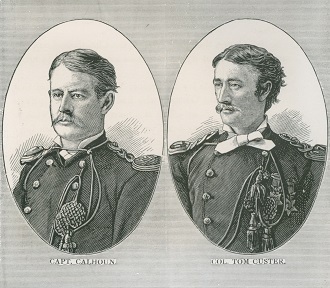 When first becoming aware of our Minerd-Miner family's connection with General Custer's brother Tom, I was deeply moved by the fact that the general was not the only Custer to die at Little Bighorn. In fact four of his immediate relatives – two brothers, a brother in law and a nephew – also gave their lives on the field that fateful afternoon. It should have been an American tragedy for all time. Instead, at best, the story has been treated in American popular culture as a mere footnote. In 2019, my article entitled “Speckled Legacy: Tom Custer’s Legacy in American Popular Culture,” is expected to be published in the Research Review magazine of the Little Big Horn Associates. LBHA is a national organization promoting the exchange of knowledge on the life and times of the general and the battle. This article is a survey of the photographs, news and magazine articles, books, stage plays, and television and movie films which have influenced Americans' limited perceptions of Tom up through the year 2002. Our veteran reunion-goers will remember this theme from our 2002 national reunion and that Tom Custer produced a son out of wedlock with our Rebecca Minerd of Tontogany, Ohio. Our family is massive, probably numbering 50,000 or more walking the planet today. Our 2019 national reunion will be a time for you to meet all-new cousins, make new friends and share some of the history of your branch. We won't gather again until 2021. Not all 50,000 will come. If they did, we'd have to rent Heinz Field in Pittsburgh, home of the Steelers. That would break our budget. Our main event will be the Saturday picnic at the Day's Inn Hotel in Donegal, PA, located just a few hundred yards from from Exit 91 of the Pennsylvania Turnpike and a two-hour drive from the Pittsburgh International Airport. Attendance at our 2017 bash was 51 guests, who came from nine states, including the furthest-traveled from Texas, and from 16 towns in southwestern Pennsylvania. Let's see if we can double this number this year! Are you game? Use MapQuest to map your route. Or set your GPS to 3620 State Route 31, Donegal, PA. Thanks to a marriage between first cousins in the 1830s, I'm a double Younkin. So were my father, grandfather, great-grandfather and great-great grandfather. This photo shows the hard-working planning committee for the annual Junghen-Younkin Reunion, of which I'm honored to be a part. I've been invited back to speak at the 2019 bash. Seated beside me, left to right: Toni and Chuck Younkin, Ralph "Mr. President" Lincoln and Clark Brocht, photographed by Linda Marker. Minerd.com is now in its 19th year. I love sharing this obsession with any who share even a sliver of interest. To my continuing amazement, the stories never stop coming, nor the images, thanks to sharing by our cousins far and wide. 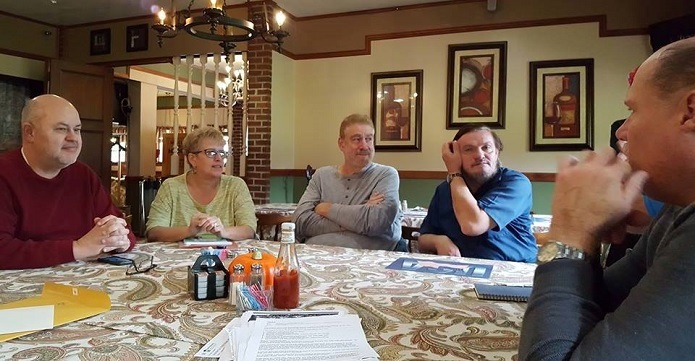 The site remains a source of fascination, surprise, exhaustion and eye-opening learning, proving more than ever how inter-connected our Pennsylvania-German families are, despite the passage of some 300 or so years since our ancestors arrived in America. If you wish to contact me, I'd love to hear from you. My response may be slow, as I'm juggling two self-employed businesses, Mark Miner Communications LLC and Minerd.com Publishing LLC, plus a few non-profit boards. I'm hoping to have more time in 2019 to devote to the work. So please be patient. Thank you again to everyone who has contributed your special part from your own family's trove of family treasures. This site is for you, and would not be possible without you. Biographies, feature stories and analysis of our family's contributions to Americana are the heart and soul of Minerd.com. Here's a list of some of the highlights made in 2018. Johannes “Jacob” and Anna Christina (Mauer) Boßhaar Sr. of Zweibrücken, Germany & Kingston, NY.